In a recent interview with GamingBolt, Mascachika Kawata, Resident Evil 7's lead producer, has announced that the game will run at 1080p 60FPS on both the PS4 and Xbox One, which is an impressive feat for either console. This is great news for PC gamers, as this means that even those with low-end hardware should be able to run this game with ease, even with the game's impressively detailed visuals. In the past, many members of the gaming press have already called the game "almost photorealistic", which is incredibly impressive for a game that reportedly runs so well. The game has already been confirmed to already support HDR and Ultra-HD resolutions on PC, with the Windows 10 Store version supporting cross-compatible saves with the Xbox One version when it launches on January 24th. A demo for the game is currently available to download, taking up 3.2GB of storage on PC. 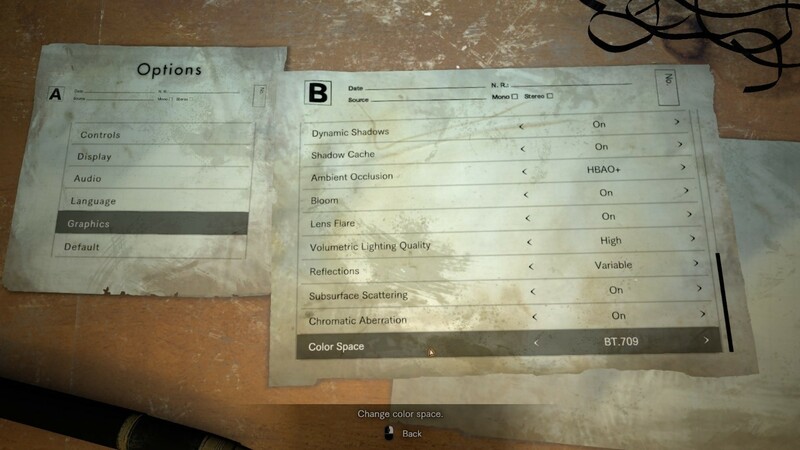 Below is a list of graphical options that the PC demo already features, though Capcom does say that they will add more before the full game launches on PC. - Screen Resolution…self-explanatory here, but the game will list arbitrary resolutions supported by your monitor and Windows desktop environment. - Refresh Rate…adjustable to frequencies supported by your monitor. Also supports 144Hz high refresh monitors including Nvidia G-Sync. - Resolution Scaling…controls the game’s internal rendering resolution. This is akin to upscaling and downsampling of the final video output. Selectable option ranges from 0.5X to 2.0X. 1.0X is 100% 1:1 native output. The higher the number, the better the image quality and more GPU ‘oomph’ required, while lowering it below 1.0 makes the image softer (but also reduces GPU overhead and increases frame rate). - Texture Quality…option ranges from Very Low to Very High. Higher quality requires additional local video memory. - Texture Filtering…option ranges from Very Low to Very High. Internally, this is essentially your Trilinear to Anisotropic filter that goes all the way up to 16X. - Mesh Quality…option ranges between Low to Very High. This option also affects Level-of-Detail (LOD) quality. - Anti-Aliasing…Selectable options include FXAA, TAA, FXAA+TAA, and SMAA. - Effects Rendering…Selectable between Low, Medium and High. This controls the intensity and density of certain visual effects. - Shadow Quality…option ranges from Very Low to Very High. - Shadow Cache…ON/OFF toggle. When set to ON, shadows for static objects will be cached in video memory. - Ambient Occlusion…Selectable options include OFF, SSAO (Variable), SSAO, HDAO, and HBAO+. Note HBAO+[www.geforce.com] is an Nvidia-specific feature. - Volumetric Lighting Quality…Selectable between OFF, Low, and High. This option controls intensity and quality of dynamic lighting including light shafts piercing through window panes and vents. - Reflections…Selectable between ON, OFF, and Variable. Affects fidelity and quality of screen-space reflections. Below are the PC system requirements for Resident Evil 7, though the game is still in active development and these system requirements are subject to change in the future. Players will have to either lower texture or set streaming textures to OFF in order to optimise performance. At this time the VR version of Resident Evil 7 is a PS4 exclusive, though VR is expected to come to the PC version at a later date. Resident Evil 7's Beginning Hour Demo is currently available to download on Steam here. You can join the discussion on Resident Evil 7's console performance on the OC3D Forums. Find all of the latest PC hardware and gaming news on the OC3D Homepage.